Famous people born on May 21, are a Gemini who want a lifestyle that is without worry or stress about housing, food or clothing. They want to be able to provide for their family and give them what they need. Having the dream is only part of achieving the reality. Characteristically speaking the May 21 famous celebrities are a barrel of laughs. They tend to stay close to their family and to their close knit circle of friends. Being in love or finding love does not come at all easy for this Gemini. However, they maintain their eagerness to share their life with someone special. 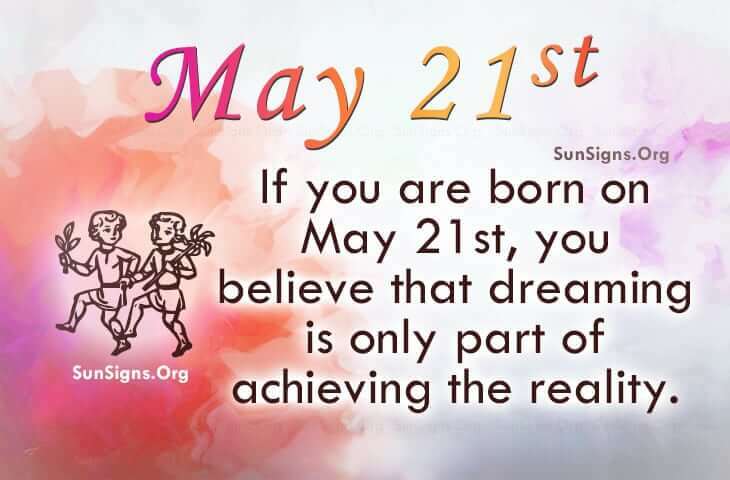 Famous people born on May 21 are smart, open and down to earth. Additionally, their recall is almost without fault. As far as their money is concerned, they know how to live below their means. This is primarily so they can splurge come vacation time and even have money to invest in their future and those of their children. Famous people born on May 21 are capable of having a million dollar bank account. Their children will love this part of them as they can be playful and youthful. They are likely to be busy with work to retain anything more than casual friendships.